In this third book of the "Codex Alera" series, you finally find out what main character Tavi's name is short for. If you've been reading with your thinking cap on, it might not be so much a surprise as a thrill of the "At last, it's out in the open!" variety. Except that it isn't really out in the open, yet. By the end of this installment you and I, and a tiny handful of characters who are good at keeping secrets, know without a doubt that Tavi is the unacknowledged grandson of Gaius Sextus, the First Lord of Alera. Tavi himself doesn't know. And he's in no position to point out what name lends itself to be shortened so. He has enough to do keeping his cover as a low-ranking Legion officer under the name Rufus Scipio. For his first assignment as a Cursor, outside the capital city where he trained to be one of Gaius's special agents, Tavi is sent off to the back of beyond, where a new Legion is being formed. The First Aleran is a patchwork of units taken from all the different city-states of the realm, ideally loyal to Gaius alone, but realistically neutral at best, because of its mixed makeup. Gaius says he wants eyes on the situation, but Tavi suspects that he is being sidelined from the action and intrigue surrounding the First Lord. Tavi has a lot to learn about being a legionare, let alone an officer. But that's all right, because most of his legion is manned by raw recruits, known as "fish." With only a few weeks on the road to train for his new cover, seconded by his academy pal Max, an old master named Magnus, and the exotic young Marat ambassador whose feelings toward him are more than possessive, Tavi must stay light on his feet. Keeping his cover, after all, means doing an endless dance to avoid revealing that he has no fury-crafting power. It doesn't help that one of his deadliest enemies—who happens to be Max's evil stepmother—suspects the truth and will go to any length to expose him. Nor does Tavi's immediate superior do him any favors, what with latrine duty being a widely accepted punishment for an uppity young subtribune. But Tavi's time of quiet reconnoiter does not last long. He has only begun to settle into his cover as an inconspicuous, junior officer when civil war breaks out. The High Lord of Kalare has decided to make his move against the throne, and he has an army of fanatical slave-assassins on his side. Plus, Kalarus has allied himself with the wolf-like Canim, Alera's deadliest enemies. While those High Lords who remain loyal to Gaius are being hammered by Kalarus's legion—while Tavi's uncle Bernard and the latter's Cursor wife Amara lead a high-risk mission to rescue the hostages Kalarus has taken to ensure the neutrality of some key leaders—while Tavi's "aunt" Isana drains herself to the point of death to heal the family's gravely injured "slave" Fade—Tavi suddenly and unexpectedly rises to command of the First Aleran, just in time to face an invasion by sixty thousand Canim. And if his much smaller and mostly unprepared legion does not hold a bridge few of them have ever heard of, the entire realm may be lost. A fury-crafter of great power might be able to stem the tide. But even now, as we find out exactly why Tavi has no furies, what can be done by a young man armed only with his wits, his instincts, and his iron will? How can one untried leader help the few people he has to help him, so as to get through a situation like this? That's what you'll find out in this book. I don't mean to spoil it with even the tiniest hint. 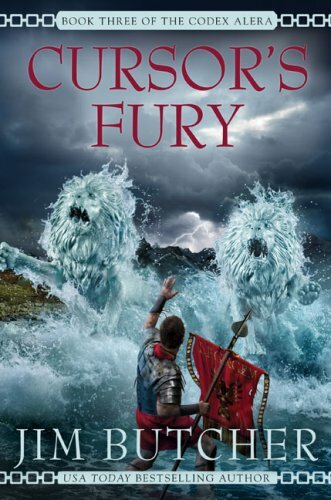 But obviously, there will still be a realm, and it will have Tavi in it, to entertain us in Book 4: Captain's Fury. 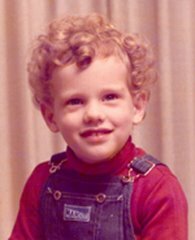 What happens when an author best known for his young adult fantasy novels pens an adult novel about crime, violence, and hair implants? Sheer mayhem! That's what happens when a former Irish Army sergeant, turned bouncer at a gambling den in the sleepy town of Cloisters, New Jersey, stumbles into the business of an unlicensed plastic surgeon, a small-time gangster named "Irish Mike," and a dirty lawyer who rips off drug dealers and sells their product at a steep markup. It all goes to show that you can take the peacekeeper out of the Lebanon, but... er... not sure where I was going with this. Anyway, Daniel McAvoy—the aforesaid sergeant-turned-bouncer—has been feeling his age. He is getting sick of dealing with his sleazy boss, bouncing slimeballs from his club for making passes at the hostess he is sweet on, and losing his hair; sick of listening to the insane ranting of his upstairs neighbor Mrs. Delano, and of having flashbacks to his military service, to which he owes his acquaintance with the amiably gross Dr. Zebulon Kronsky. Things start getting frisky when Dan drops in at Zeb's office for the final treatment of his hair-replacement therapy. Instead of Zeb, he finds an enforcer for Irish Mike there, armed with a stiletto and looking for God-knows-what. Only one of them is leaving Zeb's office alive, and when that one turns out to be Dan, he knows his troubles have just begun. Troubles such as the murder of that sweetheart hostess, a run-in with a crooked cop, a hostage situation, steamy nights with two different women—very different, wink wink—and torture, beatings, and battles galore. To survive this week of madness and murder, Daniel must trot out his considerable stash of weapons, his dormant combat and demolition skills, and his contacts with a gung-ho Irish corporal and a shrink named Dr. Moriarty. He fends off all but certain death with his fast reflexes, his well-honed instincts, and a fair supply of Irish luck. And I've tried not to mention the advice of the ghost in his head, the ghost of his missing friend Zeb, who insists that he's still alive and keeps urging Dan to find him before it's too late. Does Ghost Zeb push this book over the line into the fantasy genre? You be the judge. But first, you'd better brace yourself for a rush of tough action, hardboiled grittiness, "adult content advisory" situations, relentless suspense, and pitch-dark humor. 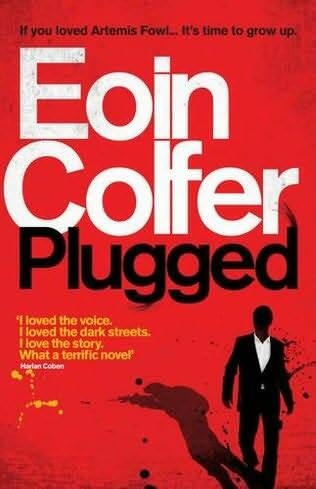 If you ever thought Eoin Colfer's novels for teens were a little too grown-up, read this book and you'll see him in his element. He must have realized it himself, since a sequel, titled Screwed, comes out in May 2013. 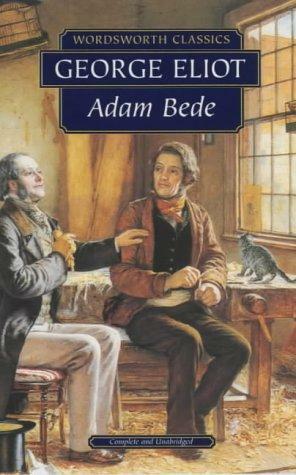 In the imaginary village of Hayslope, on the frontier between the nonexistent English counties of Loamshire and Stonyshire, round about the year 1799, a strong, manly carpenter named Adam Bede lives with his doting mother (who becomes a widow in an early chapter) and his gentle, sensitive brother Seth. The brothers love the two pretty nieces of a prosperous farmer and his wife who live nearby. Adam's intended is a vain, saucy, but irresistibly pretty little thing named Hetty Sorrel; the girl Seth wants to marry is a tender, modestly beautiful Methodist lay preacher named Dinah Morris. But (SPOILER ALERT!) Dinah would rather have Adam than Seth; and as for Hetty, she fancies the young heir of the local squire, Arthur Donnithorne by name, and he fancies her too—though the wide difference between their stations in life mean that he can never do the honorable thing by her. And so the stage is set for a novel that mixes up temptation, shame, jealousy, aborted wedding plans, a desperate elopement, an out-of-wedlock childbirth, murder, justice, the agony of lost love, the regret of a ruined friendship, the remorse of doing a wrong that cannot be righted, and a revolutionary (for its time) psychological portrait of the lives and loves of farm folk and the laboring class in upcountry England. Plus, on top of everything else, this book examines the tension between "church" (Anglicanism) and "chapel" (Methodism) in the British religious scene within a handful of years of the death of John Wesley, before the latter sect put an end to women preachers. One early chapter includes almost the whole text of a Methodist sermon; and the character of Dinah presents almost a living tract in favor of Methodist spiritual and moral virtues. Were it not for the facts that Dinah is admittedly atypical of her sect, that local Anglican rector Mr. Irwine presents an all but glowingly ideal portrait of his type of clergyman, and that the novel's hero (even from the perspective of 50 years later) prefers "church" of the Irwine school, one might almost suspect this book of being an advertisement for Methodism. None of this prevents this book from being emotionally moving. The imagination relishes the scenery of the countryside and the village where the salt-of-the-earth characters live and work. The heart bleeds for the foolish, flighty Hetty; the strong, passionate Adam; and even Arthur, who succumbs to his own weakness, tries to cover it up with lies, and has to live with the self-reproach from one bad act that poisons the rest of his life and the lives of others. Dinah's compassion on Hetty is touching, her romance with Adam sweet. The narrator's consciousness of conjuring an image of a bygone time; the gentleness of her judgment on the character of such people as the misogynistic Mr. Massey, the sharp-tongued Mrs. Poyser, and the easy-going Mr. Irwine, lend a glow of melancholy goodness to the book; and the occasional touches of satire and humor come just when the relief of a good laugh seems most needed. Published in 1859, this was the first of Mary Ann Evans' novels under the pen-name of George Eliot. Naturally, it does not show the artist in her fullest command of her powers—but, after all, I consider her Middlemarch to be THE best novel I have ever read. Even a most excellent book must want some improvement alongside that masterpiece. This novel doesn't want much improvement, however. I know of few writers, if any, who were writing at its level up to Eliot's time, and not many more who have done so since. If you wonder what would possess me to include this book in a list of titles to interest today's growing young readers, the answer is simple: It is by books like this that we measure the excellence of any new novel that comes along. And this book will get the better of a comparison with most anything printed to this day. 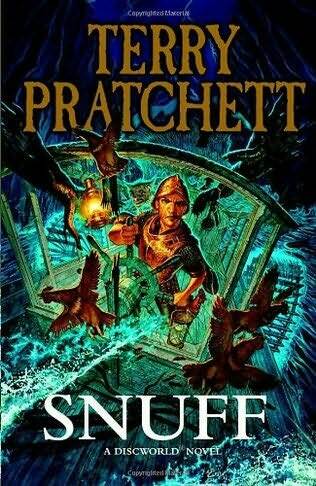 According to Fantastic Fiction, this is the 39th novel of Discworld—taking all the novels featuring Tiffany Aching, Granny Weatherwax, Rincewind, Death, the Ankh-Morpork City Watch, and whatnot in one heap. It's an amazing achievement, especially given that I was hoaxed into believing that Terry Pratchett was done writing them half a dozen books back. After all these books about a flat world balanced on the backs of four huge elephants perched, in their turn, atop a giant tortoise, Pratchett continues to break open new territory, find new depths, and conjure a unique blend of thrills, laughs, fantasy-world-magic, and real-world social commentary out of them. Samuel Vimes is many things: husband, father, Captain of the City Watch, Duke of Ankh, and blackboard monitor (don't ask). Until now, country gentleman hasn't been one of them. Born and raised in the mean streets of Ankh-Morpork, he doesn't know what to do with himself when Lady Sibyll drags him off to the Shire Country for a holiday on her ancestral estate. She means for him to take a break from police work and spend it exploring the wonderful world of poo with their little son, the ever-inquisitive Sam Junior. But a copper is a copper wherever he goes, and Vimes very quickly picks up the scent of something rotten. On the surface it seems to be no more than a conspiracy to smuggle tobacco behind the Revenue's back. Digging a little deeper, Vimes finds a rocky layer of more dangerous substances whose traffic is a capital crime... a thin but explosively brittle crust of kidnapping, murder, and corruption... and a deep, dark, smelly pit of evil underlying it all. This last evil may wear several names, such as "slavery" and "genocide"—even though its victims are mere goblins. In most jurisdictions, goblins are classified as vermin rather than as thinking, speaking people subject to, and protected by, the law. But Vimes' copperly instinct tells him that it's time for the law to change, especially after he meets one goblin girl who can make beautiful music... and sees the dead body of another, who begged for her life while she was being murdered. This puts Vimes on the trail of the sociopathic killer who did the deed, and of the "nobs" behind it—titled rich people who act as though laws are for other people. On that trail, he must escape the snare of a frame-up, rely on the services of a butler with an especially deadly skill-set, teach a gawky swineherd to be a copper, and race a wave of destruction down a raging river to save a bargeload of victims from a keen-edged villain. And there's more still. At the time of this writing, this seems to be the latest Discworld novel in print. Nevertheless, I still have a bit of reading to do before I can say that I'm fully caught up. Two previous novels seem to have slipped by me in the detritus of the dam slam (a reference you'll have to read this book to understand). I am already reading Unseen Academicals, and I eagerly look forward to getting hold of the latest Tiffany Aching adventure, I Shall Wear Midnight. For once the Discworld catches you in its orbit, it's hard to break away. More to the point, Terry Pratchett's writing never seems to lose its spin. To abuse one of his pet phrases: I guess the leopard never changes his shorts! 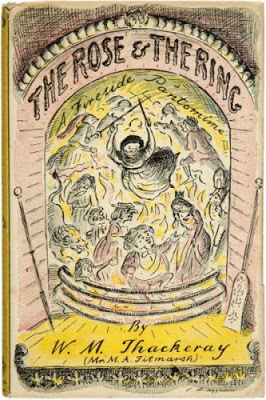 This hilarious fairy-tale spoof was written as a "fireside pantomime," to amuse a group of English children between Christmas and New Year while staying in an unnamed European city. Moreover, it was published under the pseudonym "Michael Angelo Titmarsh," if you please. Today's American children might not understand what's so funny about that name, let alone what a pantomime is or why it's remarkable to find the author of such big-boned books as The Luck of Barry Lyndon and Vanity Fair chronicling the romantic tomfoolery of the Princesses Angelica and Rosalba, and the Princes Bulbo and Giglio. But that won't stop them from giggling in all the right places. No one who is even the tiniest bit a child at heart is safe from laughing as our royal heroes and heroines are forced to keep horrible promises, face hungry lions in an arena, wander the countryside in rags, hope for a last-minute stay of execution, witness weird transformations, and deliver incredibly long speeches (which, lucky for us, Thackeray summarizes very succinctly). Finally, when everyone has fallen in love with the right person, the Fairy Blackstick delivers one last lesson. And if you've learned your lesson, it's that nothing is safe from a satirist's wit—even fairy stories. But with a light enough touch, even a tongue-in-cheek fairy tale can be magical. There is a wrong way and a right way to read this book online for free. Unfortunately, I went with the wrong way: by downloading the $0.00 Kindle version. The right way would be to visit the Internet Archive and flip through a virtual hard copy of the book, complete with Thackeray's original illustrations—for the author was also, we find, a fairly talented artist, and would have been a top-drawer book illustrator, had not the misfortune of becoming a celebrated novelist befallen him. The latter version also preserves the doggerel verses embedded in the table of contents (omitted by Kindle), the original layout of several passages where the text is laid out in whimsical braces and parallel columns (which Kindle garbles beyond all recognition), and the correct spelling of several words that, I suspect, fell into the cracks of Kindle's spell-checker. But the biggest loss is the author's flamboyant drawings, especially at points where the narrator directs attention to them. So if your e-reader permits, or you can read online, go Internet Archive. Or, if you can swing it, find a used copy. It will be worth your while. Here is a fun romantic novel about 20- and 30-somethings caught up in a swirl of "fandoms," from Peewee Herman to Fringe, from Anne Rice's vampire novels to Twilight, from a San Diego comic-con to a blog about candy bars, and of course, Harry Potter. Jack and Yani have been across-the-hallway best friends since the day she shared his calculus textbook in college. Though they have their differences—for example, she is a messy follower of pop-culture phenomena like Harry Potter and Twilight, while he is a neat freak who reads serious literature and can quote Kerouac while drunk—they complete each other. All their friends know it. They just haven't admitted it to themselves. Yet. Then Jack throws a surprise 30th-birthday party for Yani, and she suddenly realizes that she needs to see about making her dreams come true before it's too late. And so Jack wakes up to a note telling him that she's gone on a road trip by herself, hoping to forget that she is in love with him. At first dragged along by their mutual friends, then spurred by his own desperate urgency, Jack chases after her in a madcap tour of fandom tourist traps. While Yani fulfills her lifelong dreams and finds nothing but an empty feeling of loneliness, Jack survives Vominator videos, unwitting brushes with real-life celebrities, a whirlwind romance between two of his friends, several roadkill funerals, and a series of audiobooks that make believers of an SUV full of Harry Potter and Twilight doubters—all while traveling three-quarters of the way around the continental U.S. with something like the cast of The Hangover. Sympathetic fangirls (and fanboys) are sure to laugh at their high jinks, go "Awww" over their romances, blush at a bit of naughtiness, and squirm with envy of their experiences at ComicCon and elsewhere. You may even feel a nifty bite of suspense now and then. Many of us will relate to the heady blend of pride and embarrassment, boldness and goofiness that true fans can feel when sharing their enthusiasms with strangers, or even with their not-so-enthusiastic friends. Some of us may even share fond memories of experiencing the Harry Potter audiobooks and videos together, and seeing the light of fandom dawning in each other's eyes. I, for one, was impressed by the way the entries in Jack and Yani's joint candy-criticism blog jived with the stages of their soulful love story—to say nothing of their good taste in selecting Zagnut as the best candy bar ever. Like that delicious but under-appreciated treat, this book is nutty but winsomely sweet, bringing several distinctive flavors into a satisfying balance. This will be less surprising when you realize that this is not Mary Twomey's first novel. Here, for example is some information about her quartet of space fantasy novels. If she's not careful, she may find herself being followed by a fandom of her own. MuggleNet thanks this book's author and publisher for making a free PDF of the novel available for review. If you would like to buy the book for your Kindle, please visit Amazon.